You are here: Home / Sponsored / Red Rose Tea Giveaway! 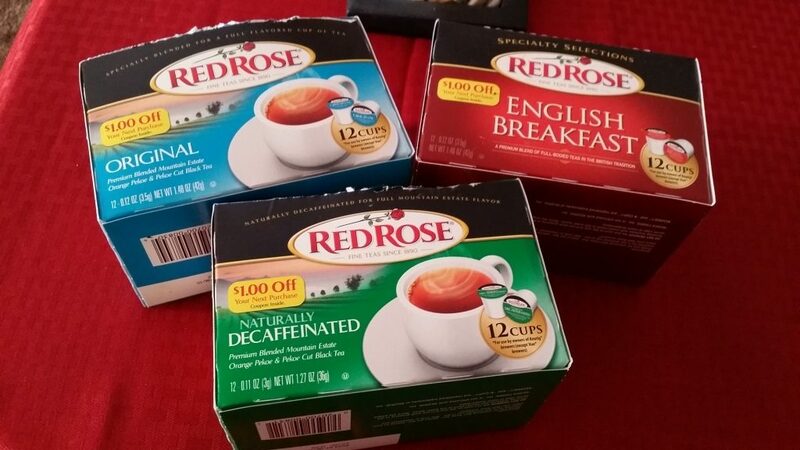 Red Rose sent me three boxes of their new single-serve cup teas and they were definitely a hit around here! The single serve teas are so easy to make, just pop them in your Keurig or other single serve coffee makers and in just a couple of minutes you have the perfect cup of tea! Red Rose Tea is brewing up three of its best-selling black tea blends in a new single-serve cup format. The rich, traditional flavors of Red Rose Original, Red Rose Naturally Decaffeinated and Red Rose English Breakfast are now available in convenient single-usage cups for consumers who have shifted to single-serve machines. The new teas, which have the same authentic blends that consumers enjoy in the tea bags, are available on shelves at select retailers nationwide and online. The new teas are 100 percent all-natural, gluten-free and contain zero calories or sugars. The new Red Rose Original and Red Rose Naturally Decaffeinated teas include orange pekoe and pekoe cut black tea. The new Red Rose English Breakfast is made from premium tea leaves from Ceylon and the Africa Rift Valley to ensure the robust flavor of the authentic British blend. The new Red Rose Original, Red Rose Naturally Decaffeinated and Red Rose English Breakfast teas retail for approximately $6.99 for a 12-count box of single-serve cups. Visit www.redrosetea.com to find a retailer near you or to purchase the teas online. Red Rose is also sponsoring a giveaway right now where one lucky reader will win 3 boxes for themselves. It’s so nice to be able to curl up with a hot drink and read a book or watch a movie on these cold winter days for sure! 1 Lucky winner will receive 3 boxes of new Red Rose single-serve Teas! This giveaway will end Saturday, January 17th, 2015 at 11:59 pm Central time and the winner will be emailed soon thereafter. Make sure you add Groc[email protected] to your address book, so you get the email if you win! I would love to try the Red Rose English Breakfast tea. I do receive Dian’s Daily Deals in my email. I would love to try and win the decaf tea, but searched all over and can’t find the link to click on to enter. I’m excited to try the decafe tea!